Alternative to liquid or dry chlorine sanitization is now available by utilizing saline in swimming pools. A residual of salt is catalyzed as it passes over an electrolytic cell into hypochlorous acid, the killing agent of chlorine. This is an effective way to have clear, clean water and an enjoyable swimming environment. Simple table salt, or sodium chloride is all that is needed in the water for a residual necessary to be converted into pure hypochlorous acid - gas chlorine. The upside is that the water never has the byproducts of standard bottled chlorine or other packaged dry and tablet forms. Our customers rave about their new swimming experience because no longer do they have that dry sticky feeling on their skin or hair. The reason is that chemical chlorine production and packaging require binders that are caustic and irritating when building up in the pool. Call us for details about transforming your system today. Hundreds of pounds of salt is added to the pool & spa to bring the salinity up to approximate 2500ppm. This allows for enough conductivity over the titanium cell platelettes for conversion to the chemical chlorine. The surprising thing is that the water is no saltier than human tears. Saline systems are sometimes combined with pool & spa automation such as the Pentair Intellitouch and Intellichlor model, or the Jandy Aquapure. Whether replacement of cells, upgrades, or troubleshooting issues, Spectrum is familiar and adept with nearly all brands and models. The Pacific Ocean has much salt compared to a saline converted swimming pool. There is little needed to enable the electrolytic process to transform regular table salt into a strong sanitizing agent without the negative side-effects of bottled and pre-packed dry and liquid chlorine. 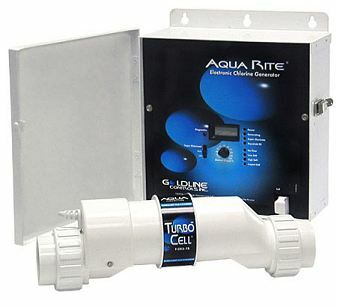 We offer a variety of saline system conversion kits for most pool and spa applications. The technology is the same, but some systems have features that may be more compatible with you specific needs and current circulation system. Our saline expert can guide you and provide a quick installation as well. Toting liquid chlorine from store to backyard is becoming less frequent these days with the advanced technology of on-site chlorine generating systems. These units allow for a low residual of saline that is constantly converted into usable chlorine to do the killing power necessary to keep algae from forming and the water clear. Conversion to a salt water pool is fairly easy and becoming more economical as well, as more and more manufacturers are developing their respective systems. We at Spectrum keep up on the current technological improvements and select the best systems to install. Give us a call for an on-site evaluation of your pool needs. Electrolysis is the process where the chemical found in simple table salt is converted into chlorine at the salt-cell unit installed on the circulation system. Once formed, it is in an active killing power to rid the water of algae and acts as a sanitizer to keep the residual necessary each day to do its work. For more information, contact our staff. Each week during the Summer, we at Spectrum get inquiries regarding converting from standard pool chlorination to automated systems. Whether it's a Zodiac, Jandy, Hayward, Pool Pilot, or any of the many generators out there, we are competent to tranform your pool today. Give us a call for further information - we're here for you. We're here daily to be of service to all of our clients. Whether a new pool pump, trouble-shooting a failing heater, or simply answering questions about saline systems, our staff is here to provide expertise in the field of swimming pool equipment and service. For a pool conversion to saline, let us know how we can be of help. The repair technicians at Spectrum can consult with you regarding your existing salt system, or an evaluation to retrofit your existing pool with a saline system. This is now a popular alternative to traditional methods of eradicating algae or oxidizing water for crystal clear results and a cleaner swim experience. Here in the San Fernando Valley, you'll find many backyard pools equipped with chlorine generators, otherwise known as salt systems. Our Spectrum repair team are professionals when it comes to installation, problem-solving or maintenance. Whether you have a Jandy, Hayward, or Pentair system, we are competent with all models. Rather than swimming in water that leaves the skin and hair dry, pools that are equipped with a salt cell do not have the byproducts that come with liquid and dry chlorine. Our clients appreciate the difference and rely on us to provide support for repairs, consultation and installation. A CPO trained staff, we're here for you.